These Black Lab mix puppies will be turning 12 weeks on arrival and the applications are flying in! Six females, four males and one is a chocolate! Spring is the season of new beginnings. Fresh buds bloom, animals awaken and the earth seems to come to life again. It's a beautiful thing unless, of course, you live in an area that is overrun with pregnant and homeless momma dogs roaming the streets and puppies being thrown into trash cans. This is the current plight in many places around the country which lack appropriate spay/neuter and dog licensing laws. Things become very desperate during puppy season in the south. These three puppies were moved from this trash can into the safety of a shelter where they are awaiting transport to San Diego! What this means from a practical standpoint is that shelters are bursting at the seams and litters upon litters are abandoned in dumpsters and on the side of the road. Shelters are forced to euthanize newborn puppies, because it's impossible to find homes for all of them. In many instances the ones adopted are returned to shelters within the next 8-9 months because they are no longer cute and little and they need training. Mothers are euthanized when their puppies actually do get adopted because they are left behind. We need to change this culture, but that takes time. It is for this reason that Thrive has chartered The Rescue Express bus to transport 75 mommas, puppies and a few oldies-but-goodies to come find new homes in California. The Puppy Pipeline is going to be a lifesaver. Literally. Meet Checkers, one of SIX German Shorthair Pointer/Blue Heeler mix puppies that will be heading our way! 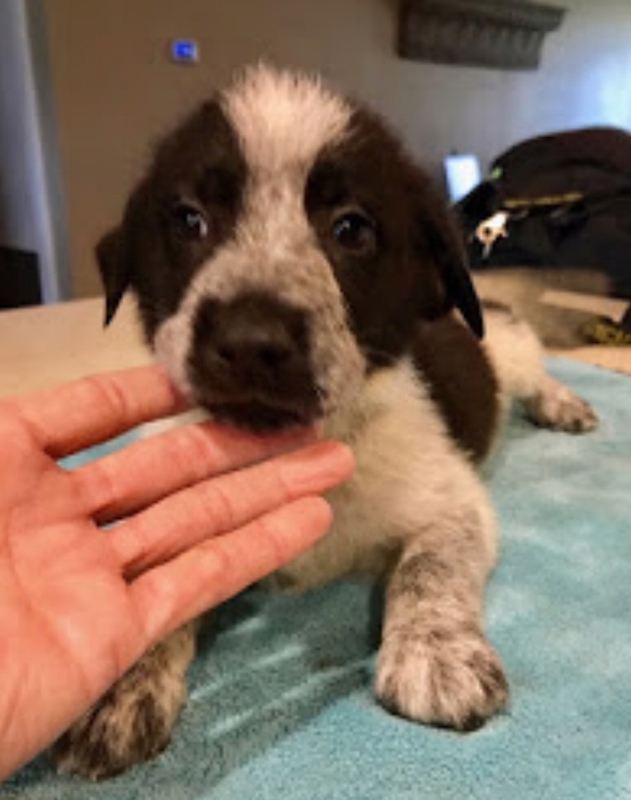 The Rescue Express Puppy Pipeline is gearing up for a transport date the third week of April and our Louisiana rescue heroines, Simply Southern Rescue and The Rescue Life (Leigh Ann Albritton, Ren Dowhaniuk and Shannon Poole Hagan) will be coordinating the amazing rescue effort. The focus will be on moving puppies and their mothers out of the local shelters and off the streets to safety while they await their ride to California. Rescue Express has saved the lives of over 14,000 dogs and cats since February of 2015, by transporting them to safety and away from overpopulated and under-regulated areas. Your help upon arrival. Greet the bus and show these dogs our finest Southern (California) hospitality! Stay tuned for updates with the most current details about our trip.